The impressive church in Piccadilly was a perfect location for a celebration of the life and works of Colin Wilson. For not only had Colin spoke there previously – on Superconsciousness – not only had it served as a memorial location for Robert Graves, St. James was also the scene of William Blake’s christening several centuries ago. As I gazed at the font which perhaps once held the infant who would later write about the cleansing of the doors of perception – lines read this afternoon by a very young relative of Colin’s – I ruminated on his theories regarding synchronicity and time perception. Thoughts that would clarify as the day wore on. At 3pm, pianist Michael Servent plays Trois Mouvements Perpetuals by Francis Poulenc, after which the Revd. Lindsay Meader welcomes us all – Colin’s family, friends and scholars – with prayers. Master of Ceremonies Colin Stanley then went on to introduce several speakers, each representing a different facet of Wilson’s ‘Existential Jigsaw Puzzle’. Gary Lachman was first up, delivering a compacted miniature of Wilsonian phenomenology. As Gary spoke about Wilson’s development of Husserl’s epoche, he demonstrated a move which Wilson himself performed at his own lectures – clenching his hand in front of his forehead to illustrate the tactility of perception. Hearing Wilson riffs such as Heidegger’s ‘forgetfulness of existence’ from the pulpit reminded me not to forget these insights, and therein lies the simple conundrum of Colin’s work. Gary will be publishing a full study of Wilson “in 2016” which is of course the sixtieth anniversary of the appearance of The Outsider (an international Colin Wilson conference will be held at Nottingham University to celebrate the anniversary). Laura del Rivo spoke next, painting a vivid portrait of Soho in the Fifties with some amusing anecdotes, such as Colin “showing three Finnish nurses around London.” Looking at the photograph on the memorial card also brought this era to life. 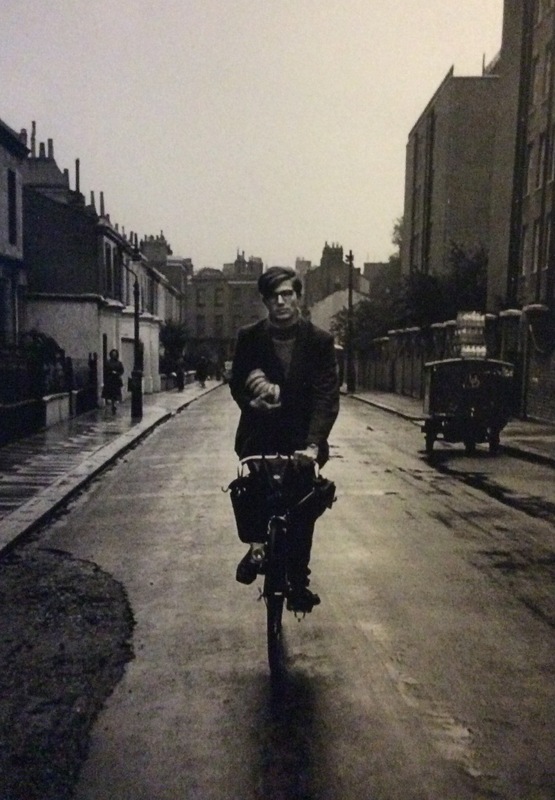 The youthful philosopher cycles through a virtually empty London street – there’s one (?) pedestrian, possibly a ‘motor car’ and a milk float piled with crates. This is the environment in which you could find yourself a hostel before signing on at the labour exchange, and instantly get some manual labour while you worked on your novels. This world, unfortunately, has vanished forever. Donald Rumbelow, criminologist and former policeman, led us through the backstreets of “Ripperology” – a term Wilson coined – and celebrated the intellectual angle of books such as Written in Blood, acknowledging the serious importance of the Encyclopaedia of Murder in the development of true crime writing. Later, Geraldine Beskin of The Atlantis Bookshop would inform us that her great-grandfather was arrested as a suspect in the hunt for Jack the Ripper. It was a day of meaningful coincidences, as Colin would have wanted. A powerful reading from Ritual in the Dark was performed by Nicolas Tredell. Hearing Wilson’s words reverberate through a building with connections to Blake was a reminder of the necessity to clean our doors of perception. Afterwards, a small girl reads those very lines. You could imagine Blake beaming with delight. Author of The Flying Cow and other Fortean classics, Guy Lyon Playfair, told us that The Occult was the most expensive book he’d ever bought – the postage to Brazil was enormous. Yet it remained his bedtime book and a classic companion to those who would walk with the Gods. It was pleasing to hear him speak about Poltergeist!, which is sometimes neglected when celebrating the paranormal corner of the oeuvre. As with Donald Rumbelow, the philosophical aspect of Wilson’s enquires into these apparently contradictory subjects was stressed. It’s a testament to Wilson’s far-reaching capabilities that it should take several speakers and musicians to do his legacy justice. For although everyone who spoke (and most in the audience, in fact) knew Colin personally, it was up to one of his sons to sum up (after Colin’s Stanley’s speech about Wilson’s importance as a writer) his father’s life with the personal touch. A recurring motif through the proceedings had been an image – a question mark. This was the signifier replacing a portrait of the mysterious Jack the Ripper in The Fifty Most Amazing Crimes of the Past Fifty Years. Colin Wilson would devour this sensational volume as an eight year old, despite being forbidden to do so, and the book would be mentioned several times throughout the memorial. When Colin’s son – and co-author – Damon gave his moving speech, pausing to be heard over the roadworks outside (drilling had interrupted Robert Graves memorial here too) this book would reappear in a typically spooky manner. Damon had spent all day clearing out Any Amount of Books in Charing Cross Road, and as the endless stock solely disappeared into his van, the room slowly became bare. His task eventually completed, Damon looked at the empty room only to spy the famous volume with the question mark portrait propping the door open. Listening to one of Colin’s sons describe his fathers’ everyday work and life was illuminating. Some books made money, some didn’t, some were commented on, many were ignored, and the Wilson household was often overdrawn. But it didn’t seem to matter; Damon noted how much his father loved to write, loved his family and enjoyed the company of like minded individuals. He was a generous man, and most of us gathered at this memorial were lucky enough to enjoy some time with him, myself included. After the Rev. Meader leads prayers and blessing, Michael Servent closes with Debussy’s Claire de Lune. The memorial over, we file downstairs for refreshments. And I, like most other attendees, promise myself to hold Wilson’s philosophy tight in my consciousness and never let go. Sorry to have missed Colin’s memorial. My husband Jerry (who died October 25 2013) and I had known him and admired much of his work for decades. My best wishes to Joy and the rest of the family. I’m glad it was a memorable occasion. I hope to be at the conference at Notts Uni. That is inspiring to hear – thanks for sharing. I concur with your comments. I read The Outsider when I was 21 and have been a ‘seeker’ ever since! I’m now 68! Read Voyage to a beginning when I was 19 during one of the worse summers of my life: fighting parents, mentally ill mother and lost relationship. The book gave me hope and insight that there can be more to life. RIP Mr. Wilson. More or less the same age I started reading him, and the exact same effect.